Cowley College students were recently awarded $3,000 in scholarships thanks to the mikeroweWorks Foundation to help finance their upcoming trip to the SkillsUSA national competition June 19-23 in Louisville, KY.
Nicholas Perry and Louis Alata (pictured), co-enrolled high school students attending Cowley College’s Manufacturing Technology (Mechatronics) program with the assistance of SB155, were the state winners of the High-School level Mechatronics competition. Todd Clubine, a Non-Destructive Testing student, was the gold medalist for the Job Skill Demonstration (Open) contest. Each student was awarded a $1,000 scholarship to assist them with the cost of attending the national contest. A total of 10 students from the CTE Department at Cowley College participated in the state contest. 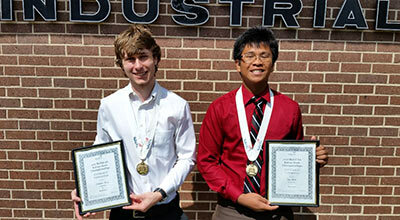 Ryan Marler, Machine Tool Technology student, was awarded bronze in Additive Manufacturing, and Sinjin McGuire, Non-Destructive Testing student, was awarded a silver medal in Prepared Speech. Daniel Higdon, the SkillsUSA lead advisor, said each of these students has demonstrated a level of skills and preparation in their field that has helped them reach this point. “I am looking forward to our three gold medalists’ success at the national level,” Higdon said. Jim Ailey, automotive instructor, and SkillsUSA sponsor will be attending the national conference with the scholarship recipients. Tina Grillot, Associate Vice-President of Business and Industry, and the rest of the department are looking forward to the success of this year’s participants and developing next year’s students.